If you buy a special witchcraft or pagan diary - do you have a favourite? I always find it is a bit difficult to choose, because there are so many great diaries to choose from and I like to ring the changes. For 2017, I decided to go for the Llewellyn Witches Datebook, but this year I am currently using the Astro Moon Diary, last year I went for the Earth Pathways Diary and in 2014 I used the Angel Diary. 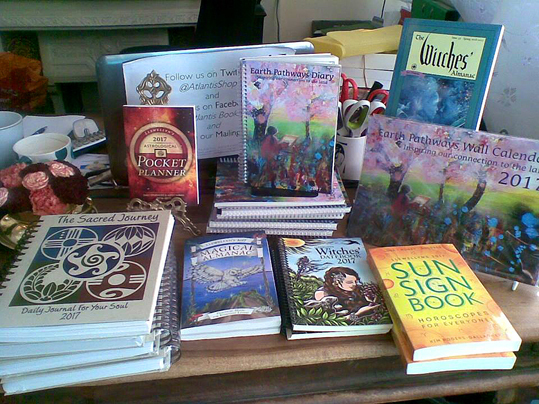 The picture at the top shows a selection of the diaries, calendars and year books at The Atlantis Bookshop in Museum Street, Central London, where I bought my Llewellyn Witches Datebook 2017 on Saturday. I prefer to browse the diaries and have a look inside before choosing, rather than just ordering over the internet. But, my question to you is - what diary will you pick for 2017?